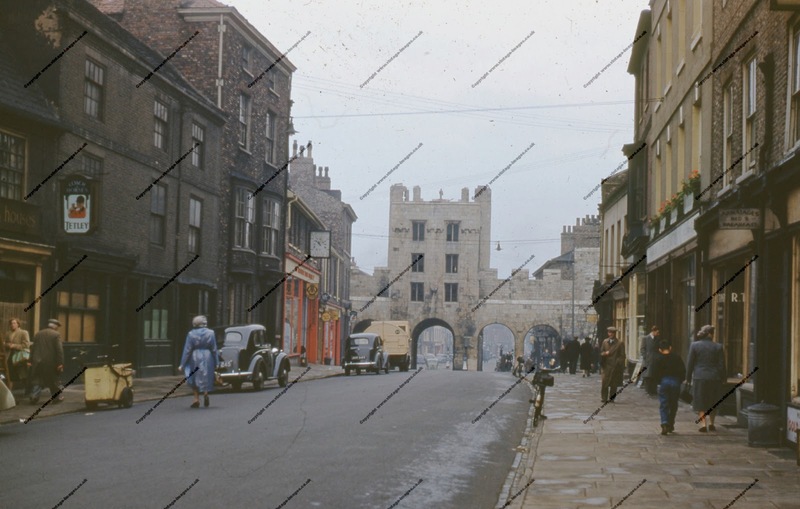 Micklegate Bar in York is seen here in 1951. The old southern entrance to the City of York is still today one of the main entrances into the centre of the city although the main road skirts round the old town by the railway station to avoid too much congestion through the narrow arches of the gatehouse. Although the gate itself survives, some of the buildings seen here do not. The three story Georgian house with the first floor bay windows has gone (despite York's assertion today to be a city that cares for its past, I suspect this building was demolished in the late 1950s or 1960s when heritage was not top of the agenda!) along with the rest of the buildings on the left hand side nearer the camera. The right hand side seems to have fared little better with, again those buildings nearest the camera now gone and the replacements seeming to be faux Georgian replacements. Now, one can no longer stay at Armatages bed and breakfast, nor indeed park your bike, unlocked propped up by its pedals on the kerb. The Coach and Horses (Tetley brewery, tied house) is no longer welcoming with its brown curtains, possibly once white but now stained with the tar from countless cigarettes. Possibly it never WAS welcoming, but you get the impression that they may have tried long ago. Pubs back then were largely the preserve of the working man, women rarely ventured alone inside. There is a garage lurking behind the red and white frontage just beyond the Georgian house with the bay windows. The clock hanging outside is JUST unreadable as to the name of the premises apart from declaring it is a garage. The road sweepers barrow is parked outside the coach and horses but no sign of him - breathalysers are well in the future here and a council bin lorry seems to be parked outside the other pub. It must have been thirsty work! And presiding over it all is the Micklegate Bar, standing sentinel and strong, for it was built as defence, for the past 800 years or so. Inhabited since 1196 it (and the heads of traitors and rebels until 1794) has over the centuries gazed silently over the streets of York.